But boy, I’m sure some of them were worried about it. I wrote yesterday about the writing cycle and our recent celebration. Well, if you remember the way the cycle works, after you celebrate, you start over again with a new project. 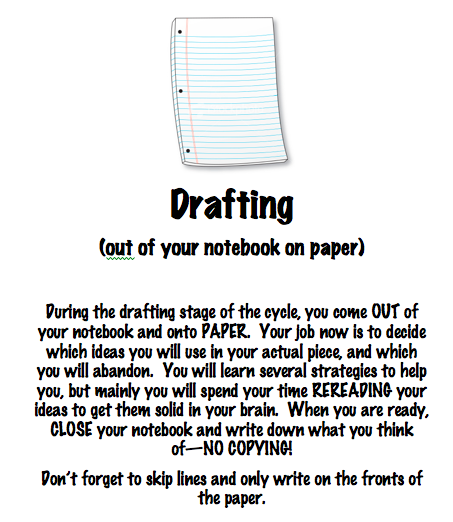 In this case, we’re working on Personal Narratives. We spent a couple of weeks collecting memories and other stories in our Writer’s Notebooks and then picked a seed and nurtured it with some help from our writing partners, and then today we were ready to draft. Now, the first time through the cycle we didn’t do it exactly this way, and maybe I even let them just use the version that was collected in their notebooks. But this time I made them do it “right.” At least my right way. And that’s when they thought they would all die…. So, as they watched and listened, I read, then reread my piece to get the big idea of how I’d written it in my head. The second time I also paid attention to the parts I really liked and knew I wanted to include in my draft. We talked about how those were parts that we read and said to ourselves: “Man, that’s good…” Those are the highlighted parts. 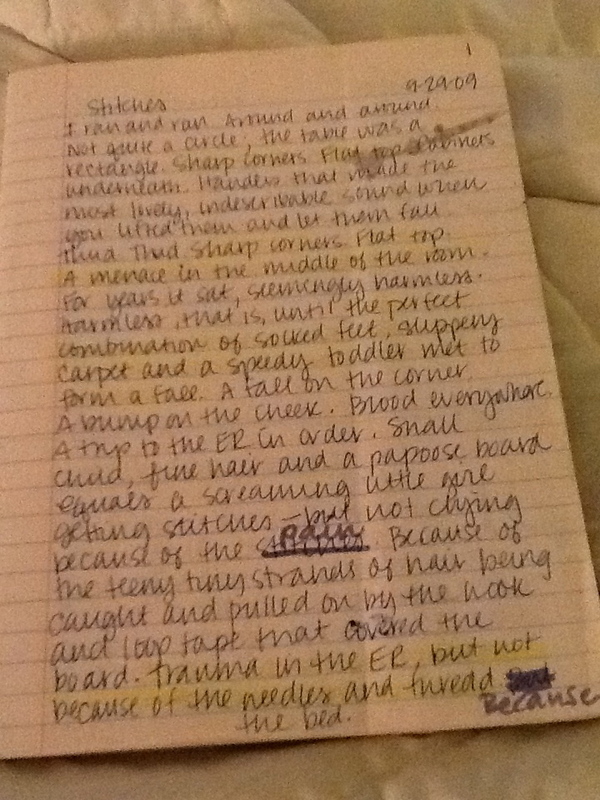 Then I read it again, and had most of what I wanted to say ready to write down. And that’s when it got scary. Now, I’ve told my kids that I wouldn’t ask them to do anything I haven’t done or wouldn’t be willing to do myself. And writing is an especially good example of this idea. I always go through the cycles with them; we write together and make mistakes together and grow together. So today, that meant that we would draft together. We sat in front of our ActivBoard, and I was ready to write my story using the document camera so they could see it. And I’m not kidding when I say that I TOTALLY understood the feeling that kids get when you ask them to do things like this for the first time. I really didn’t know what I was going to write and I had an audience waiting for me to write something fabulous! Luckily, my kids understand how to be gracious and go-with-the-flow with me, and so they supported me through this struggle. And so after we reviewed the steps: read, reread and highlight the “Man, that’s good…” parts, reread and then start writing, I sent them off. DON’T EXPECT THIS TO BE PERFECT, I tell them, because we’re going to work on revising it anyway. Give yourself a break and just write your story. 🙂 But still, there were so many frightened faces in the bunch; I really did think someone was going to throw up over these directions I had just given them. I think, though, because they trust me and they trust the process–no matter how different or crazy it seems at first–they did what I asked. The next thing I saw were kiddos all over the room drafting in a way they never had before, and not dying. They really were able to do it, and it wasn’t as hard as they thought it would be. But even it if was, that was ok. “Hard is good!” is another saying I have, because, as we have also talked about many times before, “hard” is an opportunity to learn and to do things that amaze you. Maybe the two best things that came out of today were this: one friend came to me and told me that even though this was hard, she was glad that she’d done it–the version she wrote today was even better than what she thought she could do; and another friend–who usually has trouble finishing a draft quickly, and who was a little unsure about this process when we got started today–finished his whole rough draft, and was able to do it in a fabulous way! I even got chills when I read a line from his piece because it was that good! What have you done recently that amazed you? How have you persevered through something hard? Do you have a writing story to share with us? We’d love for you to share your thoughts! 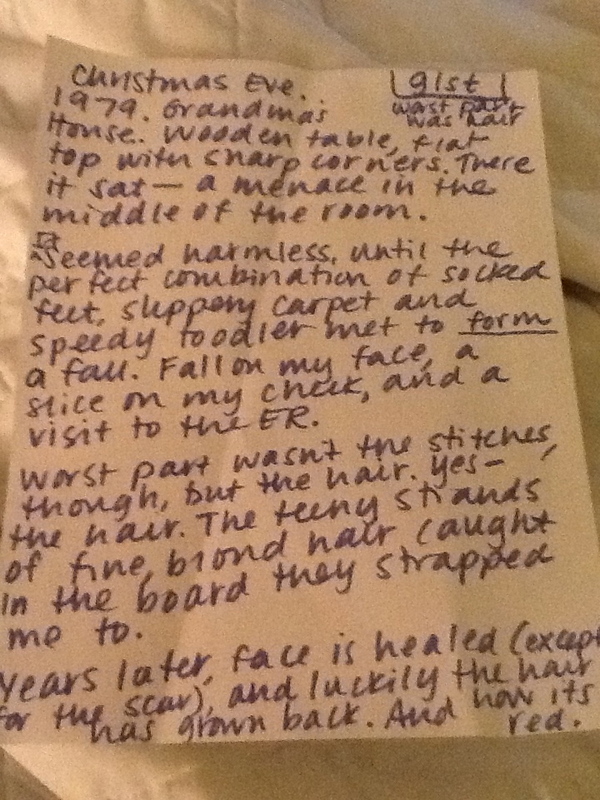 Posted on November 14, 2012 by Jen Bearden	• This entry was posted in Classroom, Writing and tagged drafting, hard, Writer's Workshop, writing, writing cycle. Bookmark the permalink. Jen, Anna was telling me about this tonight and how much it helped!!! Yay!!!! WOW! You amaze me-I can only hope to be a great teacher of writing like you one day. 🙂 Get this. Next week I am ending our isolated learning of english grammar. Yes, I said that. Of course, I’ll be the only one in my elementary school that will cease to teach english grammar in isolation. Hmmm…..must be why we’re not creating writers. My course of study says: Opinion, narrative, expository, and short research pieces.